Sorry there was no blog last week. 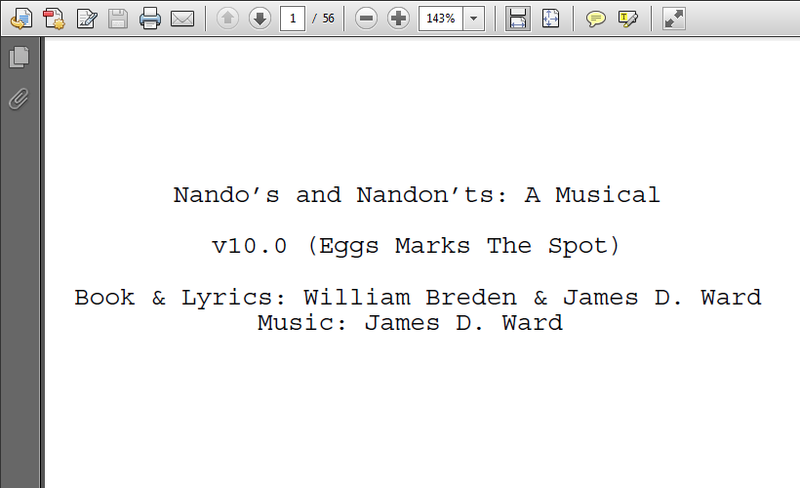 Not only did Bank Holiday delight but confuse us all, but we were in intense work on the script. On August 30th we hit version 10.0, with all songs written and words as we want them. Now, we abandon writing it for a bit. We’re giving it to our actors and close friends for feedback, then we’ll bring it back into the shop to tinker with it again based on what they think. The big day, though, is September 29th, when we’ll have our read/singthrough with the cast, and where we really find out if this script’s going to work. Musicals – what do you like/dislike? I like the post-Hammerstein musicals most, where script, songs, dance, everything works together to tell the story – even better when they’re counterpointing each other, the music saying tension when the words say bland things when the acting shows friendliness, or something. As far as specific musicals, I’m prone to reaching straight to Sondheim’s, so my favourites are West Side Story and Sunday in the Park with George. Matilda the Musical is probably the best one I’ve seen in the theatre, in its Stratford-upon-Avon run. But also, I like Singin’ in the Rain, 42nd Street, My Fair Lady, Rent, Mamma Mia!, Grease, Guys & Dolls and so on. In a couple of years I’ll even like Les Miserables again. I generally dislike jukebox musicals (Mamma Mia! being the exception, because that is one entertaining film) and I feel I’ve generally grown past Lloyd Webber (though I would like to see Evita). I’m suspicious of flashy production, as it’s often there at the expense of a compelling story. Opera and operetta are cultural blindspots, but that’s my failing, not theirs. Nando’s – how would you describe the musical style? People compare it to Green Day, which is fair, because mostly it is indeed three chords and a catchy tune. It does make sense, I listened to a lot of pop-punk as a youth. And I can’t play the ukulele very well, so no flashy chords are used. Saying this puts a lot of pressure on me if I go on to write on an instrument I’m better at. Erp. Underneath that, though, I do attempt to homage (rip off) a load of different West End and general musical styles. There are Sondheimy work bunches, Grease-like tunes, Hairspray-inspired shouting, some folk, some rock, a tango, and of course some Les Mis. Mostly, the musical style is me imagining a massive orchestra or rock band in my head, and channelling that sound into one small lump of cheap wood. Music is visible in Nando’s. Explain. I was made to. People seem to want me there, the fools. A more serious answer is that seeing the instruments on stage is becoming more popular recently. From the 2004 production of Sweeney Todd, restaged and rescored so that the 10 actors accompanied each other, to American Idiot and Once, both celebrations of bands and music in some way, to who knows what else. For us, what it adds is some good jokes, but also an element of honesty. Everything we’re doing is seen on stage, nothing hidden away, no pretensions. Also, by showing the silly little instrument we’re showing it off, celebrating it’s awkward charm (awkward charm may well sum up the show as a whole). Single instrument – why ukulele? Will there be more instruments? Does quirky use add to performance? I told Will I could compose on either guitar or ukulele, but the ukulele is basically a toy and can’t be taken seriously. He chose the uke. What I like about using the uke is that it’s portable, it’s cute, surprisingly loud, and you can play it in about three different ways (no more than three, but three is something). There may be more instruments, if there is a good reason to use them, but the purist in me likes to keep it simple. If so, however, they won’t be “proper” ones that cost real money like guitars and cellos, unless we do a massive-venue rock show/concert version of it. They’ll be similar toy-like things, and hopefully red as well. Challenge of cast of three vocally. That’s all for now. Next week: act two!